I recently posted How Much is Your Coupon Code Box Costing You? which addressed the problem of customers searching for coupon codes when they see a coupon box in the checkout. If the customer grabs an affiliate code, not only do you have to discount the product or shipping cost, but you also have to pay your affiliate a commission for a sale that really wasn’t initiated by that affiliate. Promo codes are available to email subscribers – an incentive to opt in to the email list, whoopee! I think this is rather brilliant. 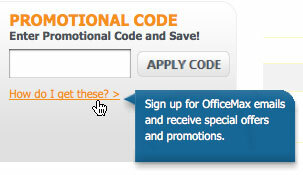 Unfortunately, Office Max doesn’t link to the email sign up in the box. Fair enough, you want the customer to complete the transaction. You could add an opt-in checkbox on the cart summary page that doesn’t hijack the customer out of the checkout process. Another hiccup is the email sign up is only accessible from the home page. Perhaps putting it in the header or footer would make it easier to find, or would increase sign ups when people land on the site on a product page. There’s also no way for the customer to enter a promo code right away without signing up for email and waiting for the first code. 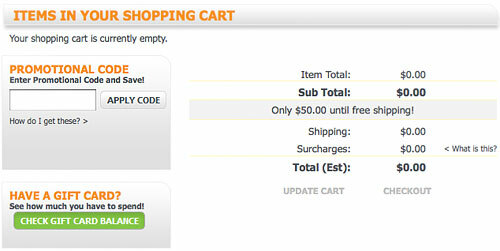 Worst case scenario, customer defers the purchase until they can get a promo code and abandons cart. Hat tip to Jason Billingsley for spotting this. Previous articleCross-Website Personalization: Will It Happen?